Anger is a natural emotion. We all feel it. It can lead to the biggest breakthroughs. But it can also be terrifying. It can make us feel out of control and concerned about we we are becoming. As part of the A to Z series, we will look at each topic from a body, mind and spirit perspective and offer you some general guidance on how to deal with the issue. Anger is an emotional response and so our brains often shut down the logical and thinking parts of our brain in order to deal with the intense emotion. This info graphic (provided by https://www.nicabm.com/how-anger-affects-the-brain-and-body-infographic/) gives a really clear description of what anger does to the brain and body. Anger is usually a response to fear or attack. It's the fight part of the fight/flight/freeze response. But sometimes we can find our anger misdirected either at the wrong person or at ourselves. This can lead to guilt or shame. 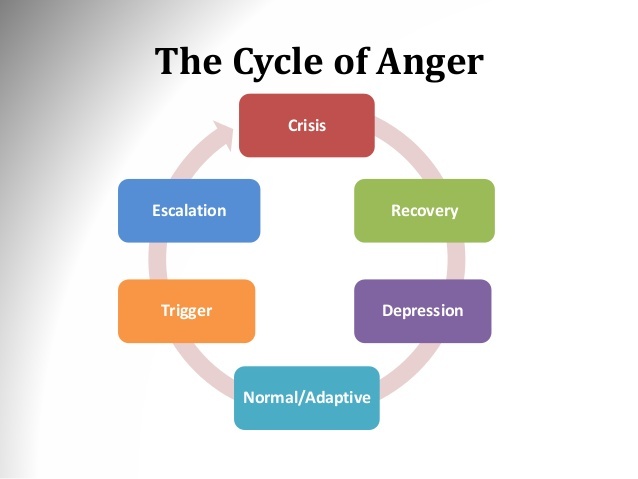 In fact even a "normal" angry outburst can lead to these emotions if you have been conditioned to see anger as a bad thing. The graphic below shows a "normal" cyclical response. It shows opportunities to intervene (which we will explore further later) to reduce the blow out which often leads to shame, guilt and exhaustion. It's important to know that anger is normal. You have been living in abnormal conditions. You have been abused. It's therefore important to acknowledge your anger for the protective response that it really is. Anger is a separation from your soul. It is often part of the Dark Night Of The Soul process. And whilst it is a normal human reaction so needs to be felt and acknowledged, from your souls perspective anger does not exist. Your soul feels peace and love. So when you feel anything negative, you are pinched off from your soul and blaming external conditions for your pain. Now with narcissistic abuse, you absolutely have every right to feel angry. But the reality is, no-one else can make you feel anything. Your emotions are yours and you alone are responsible for them. For clarity, I am not saying you are responsible for the behaviour which lead to the emotional response, just what you do from here. Anger contains powerful information, it can help us learn more about our past life patterns, and our Soul Mission, but only if we approach anger with mindful awareness. That can be a challenge itself, because our social norms do not have a place for anger, and in a relationship with a narcissist when we show any emotion but particularly anger, we are accused of being abusive. Added to that we as a humanity are not properly taught how to process our anger, and therefore we tend to stuff it down deep inside of us. You can remain in anger and feel like a coiled spring, your body flooded with harmful chemicals, and wait for the next outburst. Or you can acknowledge that your have more power and that this isn't your true self. I know which I'd prefer. If you are tired of feeling angry and are ready to deal with the emotions, book your 241 Moving Forward session for just £39.